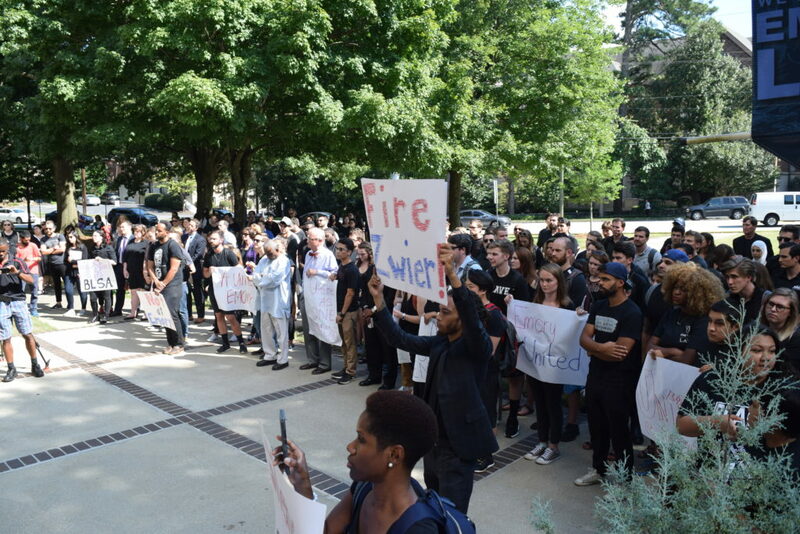 About 200 Emory community members gathered at a “unity rally” on Wednesday in response to Emory School of Law Professor Paul J. Zwier II’s use of a racial slur while lecturing in class last week. After the Aug. 23 classroom incident in which Zwier said the N-word while discussing a civil court case, the professor apologized and was removed from teaching his courses while Emory investigates the incident. The event, which was organized by Emory’s Black Law Students Association (BLSA) President Wrenica Archibald (16C, 19L), included speeches from University President Claire E. Sterk and Emory Law Student Bar Association (SBA) President Nicole ElMurr (19L). Both discussed the importance of creating a more inclusive Emory community. ElMurr said she hopes the Emory Law community can move forward after the incident. Sterk supported the sentiments expressed in Archibald’s and ElMurr’s speeches, but she added that Emory also supports free speech. Zwier attended the event for its entire duration, though he did not speak. He declined an interview with the Wheel, stating that the focus should be on broader racial issues. Tolson said he wished Sterk and ElMurr addressed the N-word incident more directly.